New Randall Fire Department Chief Kenneth Foszcz (left) is sworn in by town Chairman Bob Stoll. The Randall Town Board recognized its outgoing fire chief and swore in its new fire chief at the regular Town Board meeting Thursday. 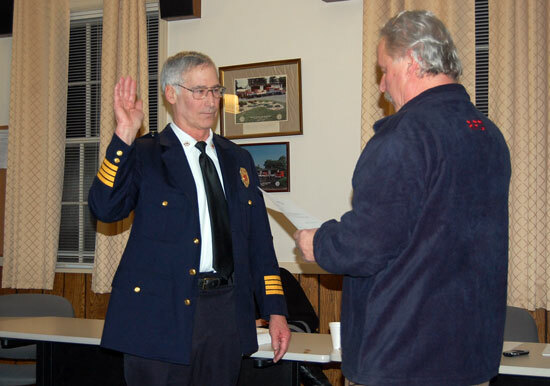 Kenneth Foszcz was sworn in by town Chairman Bob Stoll as fire chief. He succeeds Matthew Gronke, who was chief for over 22 years. Stoll, in presenting a plaque to Gronke praised his efforts on behalf of the department. Foszcz is a longtime member of the Randall Fire Department as well as a former chief of the Richmond Fire Department and a full-time firefighter with the Round Lake Fire District. With the Randall department he was most recently the battalion chief for the Bassett station. Foszcz had warm words for his predecessor. He asked Gronke to stay on as battalion chief to ease the transition and Gronke agreed. “I have some big shoes to fill with Matt,” Foszcz said. Posted in: Police/fire, Randall, Uncategorized. Hey congrats there Kenny, sure miss you guys. Tell everyone I said hi and stay safe out there.